Employers may compensate employees, either by paying them an hourly wage or by paying them an annual salary. While salaried employees earn regular paychecks—even if they work long days during busy periods, certain hourly wage-earning employees are eligible for overtime pay, for hours worked beyond the standard 40-hour work week. They must earn at least $455 per week (a salaried equivalent of $26,000 per year). They must work in an executive, supervisory, professional, or external sales position. They must have the authority to independently make significant decisions. They must have the discretion to create and implement company policies. They must occupy management roles, where they oversee other staffers. Employees who are considered "non-exempt" are protected by FLSA regulations concerning minimum wage and overtime compensation. Pointedly: They are entitled to collect time-and-a-half (1.5 times their regular hourly pay rate) for every hour worked over the standard 40 hour work week. Such nonexempt workers are responsible for fastidiously recording their hours worked. Hourly employees can significantly ratchet up their weekly pay by lobbying for extra hours. After all, employers naturally wish to give extra hours to their hungriest of staffers. Furthermore, some hourly employees have the fortune of working for companies that pay employees double their normal hourly rate for working on holidays. On the downside: Some companies keep costs down by disallowing hourly employees from working overtime. Even worse: Hourly employees can sometimes fall short of their traditional 40 hour work weeks if business is slow and they're dismissed early. Finally: Hourly employees seldom enjoy the bonuses, insurance plans, and retirement plans that are traditionally afforded to salaried employees. Salaried employees enjoy the security of steady paychecks, and they tend to pull in higher overall income than hourly workers. And they typically have greater access to benefits packages, bonuses, and paid vacation time. On the downside: Salaried employees are not eligible to collect overtime pay when they work weekends and late nights, to accomplish major projects. Furthermore, the office culture may pressure salaried employees to overextend themselves in order to compete with colleagues. In other words, salaried jobs can be significantly more stressful than hourly jobs. Whether a worker prefers an hourly position or a salaried position, largely depends on his or her temperament and personal working styles. While some workers favor the security of a regular paycheck, others prefer knowing when they'll clock out at the end of the day and delight in earning extra pay for working overtime hours. 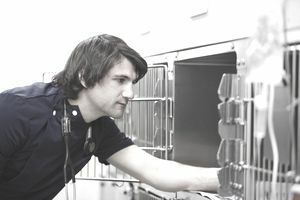 How Much Do Veterinary Residents and Interns Make? How Much Money Does a Veterinarian Typically Make?